Shah Rukh Khan’s recent released film Raees, directed by Rahul Dholakia had caused a lot of buzz. The movie starring Shah Rukh Khan, Mahira Khan and Nawazuddin Siddiqui is quite an experience and earned some good ratings from all over. Raees is rated 7.1 on the IMDb. With the powered performance of Shah Rukh Khan as an illegal drug trader and Nawazuddin Siddiqui as the Police officer who tries to catch Raees, and the beautiful Pakistani Actress Mahira Khan in the role of Raees’ wife, the action and drama in the film has made it a watch worthy experience for everybody. The movie was said to be loosely based on the criminal Abdul Latif’s life. This Bollywood film, released in January 2017, is now being premiered on Zee TV this weekend. The movie is the most anticipated as it has viewers who have missed it in the first place and the people who want to watch it for the second time. The movie will be broadcasted in Asia Pacific regions on Saturday and will also be streamed in India this Sunday on Zee TV Live. As the number of viewers of Hindi TV Channels had risen significantly in the past couple of years, YuppTV lets you watch top rated GEC TV Channels at region specific timings. 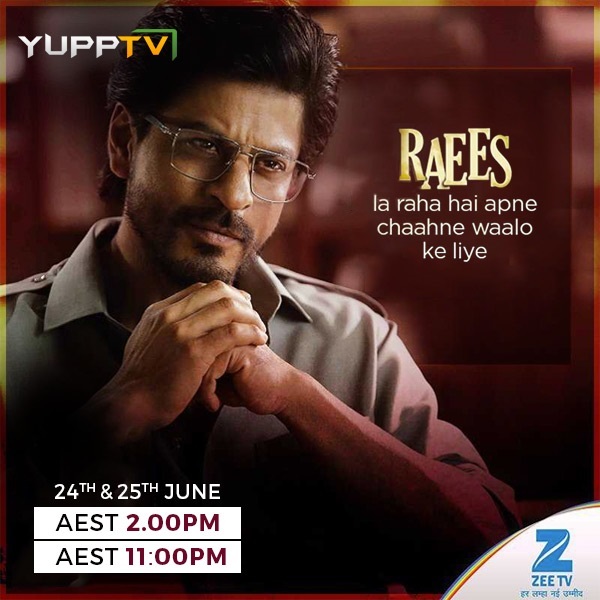 So, enjoy watching the world TV premiere of Raees on Zee TV Live through YuppTV.